In 1971, the USSR and Guinea together submitted early drafts of a convention to deal with the suppression and punishment of apartheid. 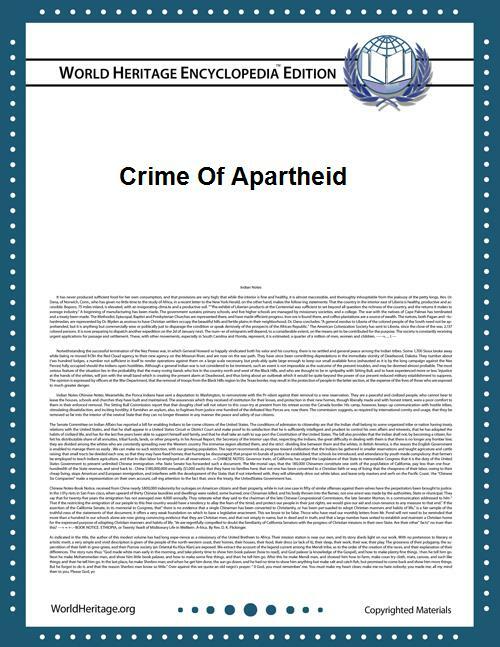 In 1973, the General Assembly of the United Nations agreed on the text of the International Convention on the Suppression and Punishment of the Crime of Apartheid (ICSPCA). The Convention has 31 signatories and 107 parties. The convention came into force in 1976 after 20 countries had ratified it. They were: Benin, Bulgaria, Byelorussia, Chad, Czechoslovakia, Ecuador, the German Democratic Republic (East Germany), Guinea, Hungary, Iraq, Mongolia, Poland, Qatar, Somalia, Syria, the Ukraine, the USSR, the United Arab Emirates, Tanzania, Yugoslavia. ^ Morton, Jeffrey S. (2000). The International Law Commission of the United Nations. University of South Carolina Press. p. 27. ^ Metraux, A. (1950). "United nations Economic and Security Council Statement by Experts on Problems of Race". ^ Goldstone, Richard J. (October 31, 2011). "Israel and the Apartheid Slander".